I’ve used the RTLSDR usb cheap dongles for a while for radio spectrum listening and scanning, but the fact is that in my case, they all are garbage. Yes they work fine for bands above 200/250Mhz (not too much noise there), but below that, my nearby powerful FM stations, overload the dongle and I can’t get much out of them (Even with a home made FM notch filter). Also in most cases, to hear HF bands (80m/40m/20) a hack (Q branch sampling) or an upconverter is needed, but still the FM stations blank out the other signals. So for a bit of more money, I’ll give SDRPlay a go, since it is a full spectrum SDR (1.5Mz to 2GHz with a 10Mhz scope band) and also it can be used successfully as a pan adapter for Amateur band radios. While waiting for my SDRPlay to arrive, and since the SDRUno program doesn’t run on Linux (I have Arch Linux), I started to get the software ready to use the SDR device with CubicSDR. 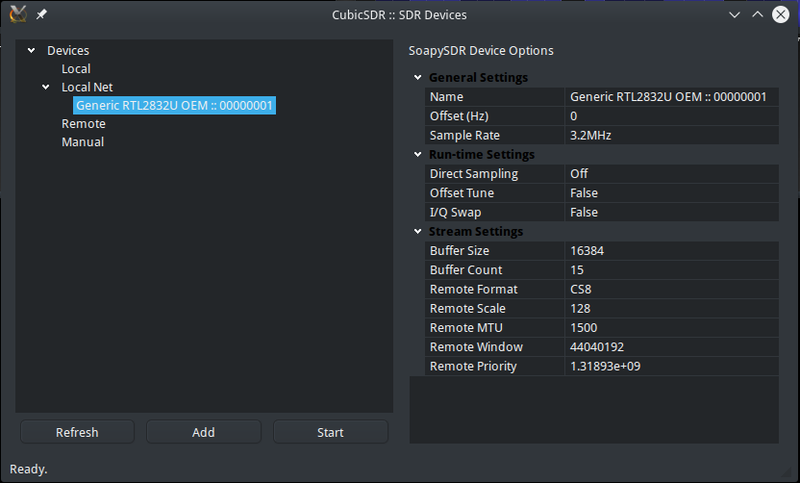 The software needed to access the SdrPlay devices in Linux is SoapySDR, the SDRPlay Driver for SoapySDR, and of course Cubic SDR. Also needed is the binary driver (yes I know… ) API/HW Driver – v2.13 to be installed. While there are a lot of instructions to compile SoapySDR and Cubic SDR, including mine: Cubic SDR and SoapySDR, and a also very good video from SDRPlay I had a problem with the SoapySDRPlay component. As we will se the problem is not with the SoapySDRPlay component but with the installation of the binary proprietary driver. make: *** No rule to make target '/usr/local/lib/libmirsdrapi-rsp.so', needed by 'libsdrPlaySupport.so'. Stop. To solve this we need to correcly install the driver, that in my case was the failure of copying the binary blob to the correct location. And then just do a source .bashrc so that changes take place. We can see now that the libsdrPlaySupport.so module is loaded. So who ever encounters the issue that I had, hopefully this will be the solution since the sdrplay binary installation scripts might fail. So I’m using remotely my RTL-SDR dongle connected to an Orange PI PC using GQrx on my desktop computer while on the Orange Pi PC I’m running the rtl_tcp server. This combination works fine, but still some times I have some lag, not common, but it happens. Anyway Gqrx is great, but I wanted to try another SDR programs, and one of those programs is Cubic SDR. Cubic SDR uses an abstration layer for accessing the SDR hardware either locally connected or over the network. So I wanted to see how the behaviour of CubicSdr, comparing to Gqrx when accessing the RTLSDR over the network. I’ve not used the available binaries, but I’ve used the code from the Git repository: https://github.com/cjcliffe/CubicSDR. So far the git repository works fine. I’m not posting here the instructions for building the CubicSDR because the full instructions are at the Cubic SDR wiki. Just make sure, when compiling, to give the correct path to wxWidgets when building Cubic SDR. Installing the above software we can use the attached locally RTLSDR dongle. The remote server where my RTLSDR dongle is connected is an Orange Pi PC running Armbian. To let my desktop running CubicSDR program to access remotely the dongle, we need to install SoapySDR Remote that allows remote access to the SDR. * Buffer Count - Number of buffers per read. So all we need is now on the startup SDR device screen selection add (by pressing the Add button) the remote IP of the Orange Pi PC server to access remotely the RTLSDR dongle. And here it is the CubicSDR in action. The CPU usage and temperature on the Orange PI PC is not a problem when using the server. CPU usage floats around 40%, and no meaningful or worrying changes on the CPU temperature. So the Orange PI PC is up to the task without any issues when serving data with SoapySDRRemote. Also with CubicSDR and SoapySDRRemote, I’ve experienced no lag when changing frequencies, namely when dragging the frequency selector.. It seems that all changes are instantaneous and note that my desktop connects to the remote server through a 200Mbps PLC and only then it is cable network to the Orange Pi. According to my desktop PC network widget, when receiving data, I have around 6.5Mbps of data comming in when using the maximum sample rate of 3.2MHz. Also it took me a while to get used to the CubicSDR user interface, but overall for things like fine tuning, since it has a dedicaded codec screen, is much better than Gqrx. Also one great feature is if we keep dragging the spectrogram window, the central frequency changes so it keeps up with the SDR bandwidth, shile in Gqrx we need to dial in. Still I’m using Gqrx and rtl_tcp since CubicSDR has no data output, other then piping audio. Gqrx can pipe to UDP, that allows the decoding of digital modes locally or on other servers without messing around with PulseAudio and Jackd. Anyway CubicSDR is a great SDR application and the future looks bright. I do recommend to give it a test drive. OrangePi, rtl_tcp and power line communications. The initial reason for buying an Orange Pi PC was to remotely used it as a server for the SDR dongle and run the rtl_tcp program. In my desktop PC, running Arch Linux and using Gqrx, I can connect remotely and avoid the massive interferences produced by my desktop. Direct connection through ethernet cabling and 1GB switch showed that the Orange PI PC + RTL SDR + rtl_sdr, after some tweaking, would work just fine, with no annoying lag between commands and response to/from the rtl_tcp program when using the Gqrx. The issue is/was that the location for my remote SDR would mean that the connection would be made through PLC: Power Line communications. PLC uses the power lines distributing electricity around the house as the medium to connect devices without using ethernet cables or wifi. 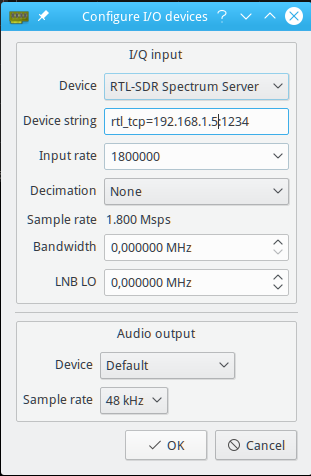 I had doubts that with my Devolo 200MBps PLC that would provide stable connectivity for the I/Q stream from rtl_tcp, but I was wrong. Using the rtl_tcp through the 200MBps PLC works like a charm, and I only have a slight lag (around 1s) between commands and response. The problem with PLC is that them by themselves are also huge interference generators, and so I still have some noise issues, but nothing compared to the rtl sdr being near my computer. The 868Mhz ISM band is now pretty much clear and we can see all the devices communicating. A few weeks ago I’ve bought an SDR RTL2832U+R820T2 dongle to do some tests with Software Defined radio. Despite of being able to catch some signals with the provided antenna, I have a huge interference problem originated from my desktop PC. Using the SDR dongle connected to my laptop and with the desktop PC off, most part of those interferences disappear. Still reception was poor due to the antenna quality and my office location. So one solution for the above issues is to remotely put the SDR dongle in a better location and with a better antenna and connect the SDR software running on my desktop PC to this remote SDR dongle by using the rtl_tcp program. Since I didn’t want to shell out a lot of money again for a RPi or Odroid C1/C2, I’ve decided to by an Orange Pi PC from Aliexpress for about 16.5€, postage included. The Orange PI PC is a small form computer like the Raspberry Pi and Odroid C1/C2 for example. It has a quad-core Allwinner processor that runs at 1.2GHz (under Armbian), with 1GB of memory, 3 USB2 ports and HDMI. The Orange Pi provided operating system seems to overclock the CPU to 1.6GHz which brings a lot of stability and heat issues to the device. The Armbian version seems to not suffer from such issues and works out of the box, including HDMI video output and apparently video acceleration (Haven’t tested it yet). I’ve also bought, separately the acrylic box and a 2A 5V charger with the correct plug to connect to the Orange PI. The Orange PI, box and power supply took less than 3 weeks to arrive. The Orange PI needs an small form micro SD card to have the operating system installed and space for the file system. The recommend cards are Sandisk UHS-1 or Samsung UHS-1, but I’ve bought a Toshiba micro SD Exceria UHS-1 card, that works fine. The card comes with a standard SD card adapter to be used when connected to a card reader. After copying the Armbian operating system to the card on my desktop computer, and putting it the micro SD card slot on the Orange PI, I’ve just connected the network, HDMI and power. The initial power up sequence can take several minutes, since it will expand the file-system on the SD card and probably sets up other things. At the end there was a RED led steadily lit and a blinking GREEN led, with the Armbian desktop on my monitor. – Change the root password from the default 1234 to a secure password. And finally we can reboot and connect our RTL SDR dongle. About 40% slower than my Odroid emmc disk. The Orange Pi CPU and temperatures with rtl_tcp running and connected never rouse above 7/8% CPU and 43ºC, so it looks good! On the Orange Pi, the rtl_tcp program was outputting a lot of ll+:### where ### is an increasing number, and I had several seconds of lag between the change of frequency on the Gqrx aplication. and all ll+ messages where eliminated never rising above 5.